Enter your email address and we will email you the recipe with cooking instructions and a coupon. Sign me up for the Alter Eco newsletter! We will not share your email with any 3rd party. 13,000 feet up on the Bolivian desert of the Altiplano, traditional Quechua farmers tend to the coveted “Royal Quinoa”. Due to the unique combination of high altitude and a warm prevalent climate, "Royal Quinoa", the "Champagne" of quinoa, is a larger seed, richer in protein, that has remained the same for centuries, never genetically modified or subject to hybridization. This pearl-shaped, nearly perfect nutrition source was so revered by the Incans that they called it “chisaya mama” or “mother grain.” We call it nutty, delicious and endlessly versatile. *technically, quinoa is an edible seed related to beets, spinach and tumbleweeds! 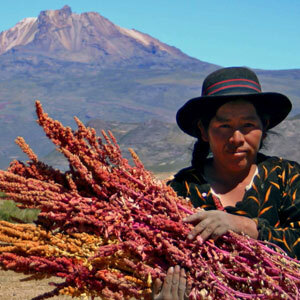 Alter Eco Royal Quinoa is ethically sourced from the ANAPQUI cooperative in Bolivia. Planted and handharvested on small family farms, Alter Eco Royal Quinoa is cultivated organically and sustainably. Farmers receive an 8% premium over market prices for their crop. Through a triple certification - Fair Trade, Organic and Carbon Neutral - Alter Eco adheres to strict standards in order to offer you highly sustainable foods.